Two important reports on trade secrets protection were recently issued: one by Baker McKenzie and Euromoney Institutional Investor Thought Leadership and the other by the Office of the Intellectual Property Enforcement Coordinator (IPEC). 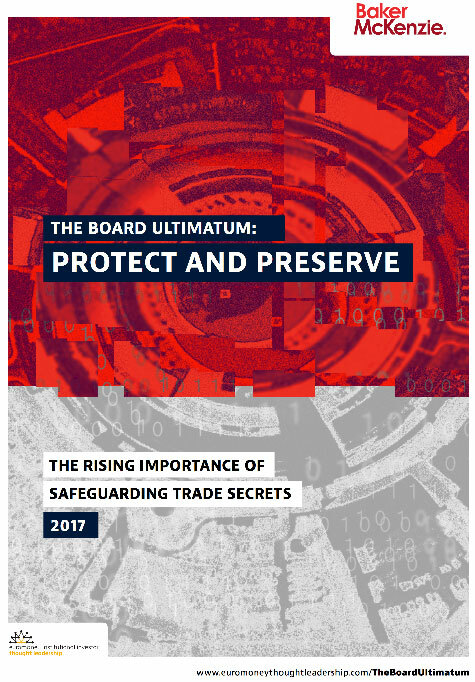 Four out of five (82%) senior executives say their trade secrets are an important, if not essential, part of their business, while 60% say protecting their trade secrets is a board-level issue. Almost half (48%) of those executives said their trade secrets were more important than their patents and trademarks. One in five companies think or know they have had trade secrets stolen. Theft by ex-employees and third-party suppliers are the biggest sources of anxiety among two-thirds of executives. The Strategic Plan has been prepared to go beyond a compilation of abstract goals or objectives, placing heightened importance on the need for a detailed assessment of the challenges faced by creative, innovative, and law enforcement communities, domestically and overseas, with respect to IPR enforcement. By adding increased attention on the speci c dimensions of the evolving IP enforcement challenges before us, we may better advance the development of narrowly-tailored, but strategically-aligned, solutions in the months and years to come. As such, this Strategic Plan represents the beginning of a continuous process, and not the culmination of one. 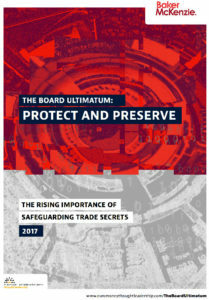 This Strategic Plan represents a “call for action” for all nations—as well as international organizations, industry, educational institutions, and consumer protection and public interest groups—to provide forward-thinking leadership and a collaborative approach to combatting illicit IP-based activities. Together, we can enhance our enforcement programs and policies for the modern era, and ensure that collective efforts to curb illicit trade in counterfeit and pirated goods, online commercial piracy, trade secret theft, and other acts of IP infringement are maintained as a top priority. For some good background reading, take a look at the Congressional Research Service’s “Protection of Trade Secrets: Overview of Current Law and Legislation,” issued on April 22, 2016 – just before the Defend Trade Secrets Act was signed into law.